Color: blue. We find it to be the most economical option for all parts. 🎀🎀ADRIANO GOLDSCHMIED SIZE 28 🎀🎀. • INSEAM 30”. • WAIST15”. DETAILS AG Adriano Goldschmied "The Jodi Crop" high-rise slim flare crop jeans. Stretch denim. Zip fly, 5 pockets. Rise - 8.5". All clothing is laundered and coming to you from a non-smoking household. AG Adriano Goldschmied Womens distresses Ankle Slim Straight Denim Jeans Size 27. Condition is Pre-owned. Shipped with USPS Priority Mail. These jeans are amazing(see pics. RISE 8 IN. WAIST 15 IN. GREAT Dark WASH! (see pics). ACROSS (WITH NATURAL DIP). ). Hardly worn. No flaws or issues. Soft cotton denim stretch blend. across waist before any stretch 27". Hi rise 9.5". Inseam length 30". Skinny leg opening 5". Style: Stevie. Condition: Fair pre-owned condition. No holes, tears, or stains. AG Adriano Goldschmied THE LEGGING JEANS. Super skinny ankle. Waist: 14.5". AG Adriano Goldschmied THE STEVIE SLIM STRAIGHT Ankle Jeans Navy Sateen Pant 28 R. Condition is Pre-owned. Excellent pre-owned condition! The first 2 pics are stock photos of the same item, the rest are mine. Check out my other listings! Thank u! Adriano Goldschmied AG Ex-Boyfriend Slim crop Slouchy Slim jeans 30r. Condition is Pre-owned in excellent condition. Shipped with USPS Priority Mail. Size = 26R Regular / Inseam: 31". Fit = Super Skinny. We PROMISE we can make you happy if you give us a fair chance. Style: THE LEGGING ANKLE - SUPER SKINNY ANKLE. Ankle Opening: 4.5". Inseam: 29". Amazing A.G. Adriano Goldschmied THE STILT ROLL-UP White Denim jeans-29 x 27.5"
Size 29R = 8. These are an amazing pair of jeans, a thick denim stretch blend. Front rise: 8" from the base of the crotch to the top of the waist. VERY GOOD condition. 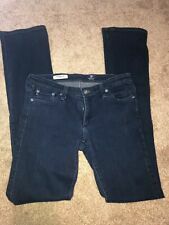 ag adriano goldschmied Skinny Leg Blue Jean Size 30. Condition is Pre-owned. Shipped with USPS Priority Mail. These jeans are amazing(see pics. RISE 7 IN. GREAT Dark WASH! (see pics). WAIST 14 IN. ACROSS (WITH NATURAL DIP). ). 2XSSML0002468101423 in.24 in.25 in.26 in.27 in.28 in.29 in.30 in.31 in.32 in.33 in. 25 in.26 in.27 in.28 in.29 in.30 in.31 in.32 in. 25 in.26 in.27 in.28 in.